The Martinsburg Mall is undergoing a major redevelopment. This includes the demolition of a deserted Sears department store and creating four pad sites for restaurants and stores. 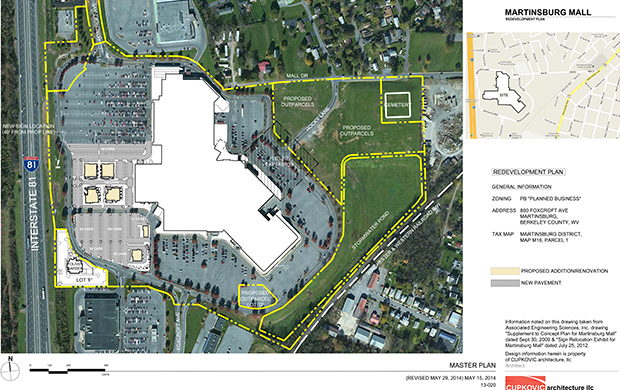 Additionally, two other pad sites will be available in the southwest parking lot of the Mall (near Olive Garden). According to the news release, some of these sites have already been leased. There is a rumor that one of these sites will be Panera Bread. Also, there is speculation that this project is only Phase 1 of a larger project intended to completely redesign, upgrade and add more businesses to the entire mall property. First off, I'll introduce myself. I live in Chambersburg, Pennsylvania. I love to look at this West Virginia forum because it is so active and full of growth and development threads. City-data doesn't have a South Central Pennsylvania sub-forum, so there's really no "four state region" chat. Contrary to popular belief, people in Franklin County don't identity themselves as residents of the Harrisburg suburbs, we're more loyal to the four state region itself. As for the mall redevelopment, it sounds like a great opportunity for the area! The more "Main Street" style centers are becoming popular, and it looks like that's what the West side of your mall will have. Someone in another thread mentioned that they want to see a Longhorn Steakhouse, and I'm sure that's a possibility! Olive Garden and Longhorn seem to pair well together. In Chambersburg, we got both in the same plaza. The lower two buildings in the cluster of four look to be about the size and shape of Longhorn, and Darden sees Longhorn as their growth brand. How is the Chambersburg Mall doing? I haven't been that direction in a long long time. We did get a Books-a-Million in the mall, but it's pretty small. Everyone in town shops elsewhere. The mall has become a "look for dress pants for a funeral" kind of place. Good grief another Panera...there is one ten miles away in Ranson plus one in WInchester and Hagerstown. THat is FAR too many of them for the area. They should put something in that is not in Ranson at all so as to distribute the people to both locales. I'm curious how a Longhorn Steakhouse would fair in that location. There is a Logan's just on top of the hill and I think a Texas Steakhouse closed down not too far from this proposed area. Longhorn is fancier and kind of expensive compared to Texas Roadhouse. Yes, I have been watching the demolition of the mall week by week. Was there this past weekend and walked around a bit. Was wondering what was going in there afterwards if anything.